With a slew of complimentary services such as free breakfast, Wi-Fi, parking and more, Comfort Inn Santa Monica-West Los Angeles makes the perfect option for families who have a budget but are still looking for a quality hotel. Did we mention there’s an outdoor, heated pool? 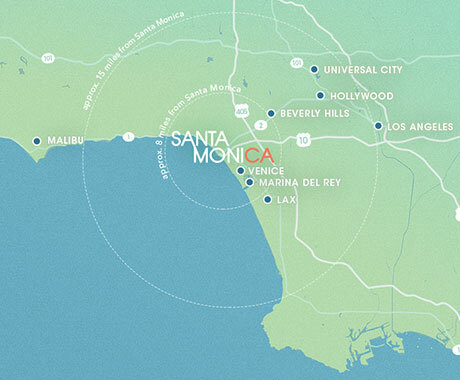 Within easy walking distance of all major attractions, Courtyard by Marriott Santa Monica is a real treat for families. Kids will love its 2nd-floor pool and floor-to-ceiling windows. Another great beachside option, Fairmont Miramar Hotel & Bungalows offers connecting rooms, one-bed suites with sofa beds, an outdoor pool and jacuzzi, and 24-hour room service with children’s menu. Located right on the beach, Hotel Casa del Mar is bound to keep the kids entertained – with an outdoor swimming pool, free beach toys and umbrellas, a family-friendly restaurant, and more. Just one block from the beach, JW Marriott Santa Monica Le Merigot offers treats for kids and adults alike – with a heated outdoor pool, full-service spa, and 24-hour room service with family-friendly menus. Boasting ocean, mountain and city views, Le Méridien Delfina Santa Monica is a beautiful base for all ages. Its contemporary, two double-bed rooms easily sleep four; plus, there’s a fantastic pool. 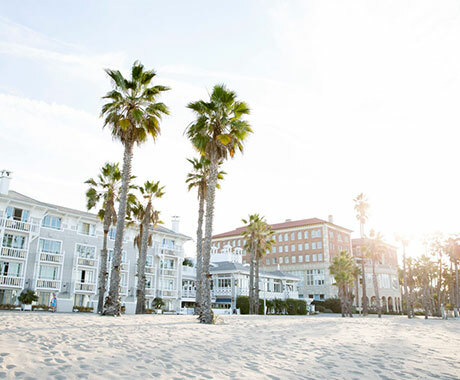 Offering unobstructed views of the Southern California coastline, Loews Santa Monica Beach Hotel will wow kids and adults alike with its spacious suites, oceanfront pool and eco-conscious spa – not to mention their Loews Loves Kids program. A deluxe room or one-bed suite at the Oceana makes an ideal base for families. Plus, there’s a kid-friendly room service menu, spacious outdoor pool, and easy access to the beach. With fun and funky decor and rooms full of character, Sea Blue Hotel is one of the best non-chain, family-friendly options in town. Plus, it’s just a stone’s-throw away from Santa Monica Pier. Located in the heart of Main Street, Sea Shore Motel is a great option for families. Suites are available at affordable price and offer a full kitchen, private balcony, and multiple bedrooms. Looking for an eco-friendly, beachfront base for your family’s Santa Monica vacation? Look no further than Shore Hotel – complete with energy-saving rooms, spacious baths, and a great onsite pool.